Lotus SuperJanky by Junko Mizuno x Superplastic! As we reported yesterday, it looks like the rumours are definitely true! 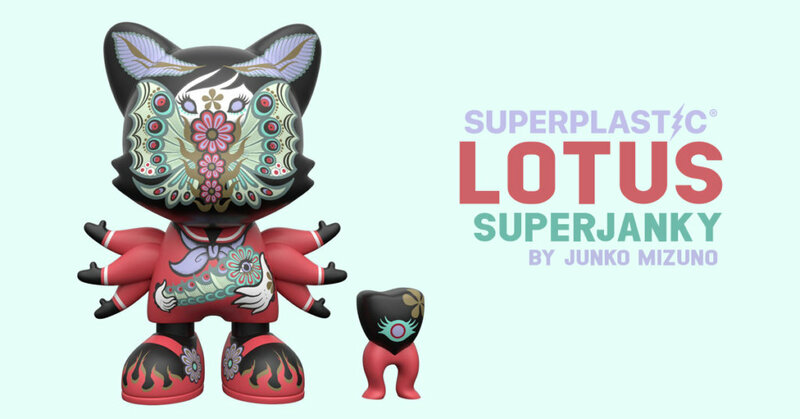 The Lotus SuperJanky by Junko Mizuno is ready for release. Right now it is available for Superfamily members only for a 24hr window. Not sure what makes you part of the Superplastic Superfamily but we hear an email has been sent out to those members. Although we are sure the sleuths amongst you will be able to find it. Limited to only 300 pieces, we can’t imagine that this will be around long! Especially considering how popular the White & Black Lotus 3.5″ Janky have proved so far. Priced at $75 (£58). The Lotus SuperJanky stands at 8inches tall. We think the non-Superfamily members will get access to this Lotus release on Tuesday, once the 24hr window has ended. Be on the lookout on the Superplastic online store.